This recipe is one of the top on Snack Girl and I couldn’t be prouder. you've successfully converted me!! making this for the second time this week tonight! and I will convert you into someone who loves broccoli as much as a bacon cheeseburger (or almost as much as a bacon cheeseburger). I came up with a broccoli recipe that includes a SECRET ingredient that I will now share with you. Have I made broccoli unhealthy by adding some sugar? Well, if you believe that one teaspoon of sugar - a mere 15 empty calories - is going to ruin your 2 pounds of broccoli - then I feel for you. The idea is pretty simple. You add sugar to the broccoli so that when it roasts you get a sweet flavor (and it caramelizes a bit). And, yes, add some olive oil too! Also, you need to cut the broccoli lengthwise (like in the photo) and cook it a very high heat. This way, you seal in the lovely flavors and the result is unlike any broccoli you have ever tasted. Be sure to follow the exact directions below. My husband neglected to preheat the baking sheet (and he used a glass casserole dish) and the broccoli didn't get soft enough for the kids to eat. 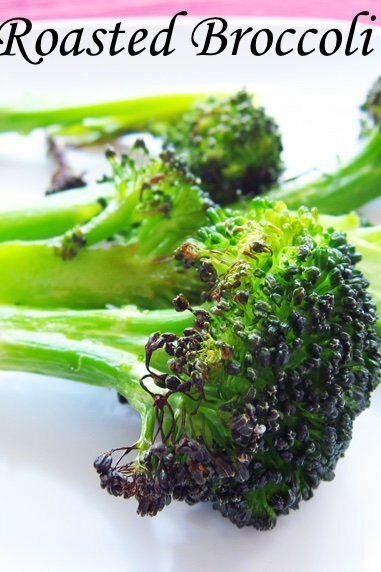 Make a whole bunch of this broccoli and keep it in your fridge for snacking. You can add this to your favorite salad as a welcome change or just create an entire salad of this recipe. It can be served cold, room temperature, or hot and would make a great party snack. This recipe boasts 337% of your daily value of Vitamin C and 9% of your daily value of Iron. Broccoli is just a fantastic source of nutrients! Have you tried adding sugar to broccoli?" Preheat oven to 500F. Cover the bottom of a large rimmed baking sheet with aluminum foil (not necessary but aids in clean-up). Place sheet on the lowest rack of the oven while oven heats up. Cut crowns into 4 wedges LENGTHWISE (see photo above). 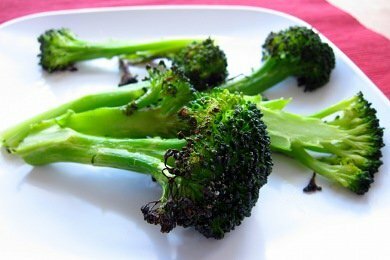 Place broccoli in bowl and add olive oil, salt, sugar, and pepper to taste (optional). Toss to combine. When oven is heated, place broccoli on baking sheet and roast for 11 minutes (until slightly browned). Serve and enjoy! I love broccoli any way I can get it..Never thought to add a little sugar.. I usually just do a little olive oil along with some salt n pepper n garlic powder and roast it up.. makes a good snack also.. I can't wait to try this. Love broccoli any which way but this sounds amazing especially for snacking. I think broccoli is the BEST! I'm trying to convince my friend to try different ways to eat cauliflower and for my husband asparagus. I've made broccoli this way but also add a splash of balsamic vinegar. My kids love it! Looks yummy! I love broccoli fixed any way as long as it isn't overcooked or completely raw. I'm going to try this recipe for something different and eat it cold for snacks. Try roasting brussel sprouts with a spritz of vegetable oil and a pinch of sea salt. Roast at 450 until it starts to brown. The roasting brings out the sweetness. Good cold for snacks. Bet you can't eat just one, but then again, you don't have to stop there!!! Hi! So, if we are being exact, I have two questions - are we baking or broiling, and when you say to use the lowest rack to preheat the pan, dowe then also cook on the lowest rack - which to me is the ones closest to the baking heating element. Thanks for clarification! My mom sautées asparagus this way (olive oil and a tsp of sugar, plus salt) and it is delicious. Now I will have to try it with broccoli! Thanks, SG! I know that this will not win me any friends here :) but I used to roast a toaster-over-tray of broccoli to eat with lunch almost every day. One day, I mused about possible carcinogens created during the roasting process (since eating little burned bits seemed kind of unhealthy) and wondered if there was a healthier way to prepare the broccoli. Apparently, the "superfood" feature of broccoli is due to a compound called "sulforaphane" (which is believed to provide its tremendous antioxidant value). Raw broccoli provides lots more of that compound than does cooked broccoli. (It looks like cooking broccoli locks the compound in, so your body can't access it. They added that if you must cook broccoli, steam it until it's cooked, but is still crunchy, because that may keep some of the sulforaphane available to the body. I can certainly appreciate your information, however, there a many foods that are not really good to eat, and I am feeling that roasted broccoli, isn't top on the list.If I had to ear steamed broccoli I would gag. Raw, however I do love, but I don't see any harm in a meal including roasted broccoli once in awhile. Thanks Andy for the info,and thanks S.G. for the recipe!! "there a many foods that are not really good to eat, and I am feeling that roasted broccoli, isn't top on the list."